Available for the first time in a single volume, Ranier Maria Rilke's two most beloved sequences of poems rendered by his most faithful translator. 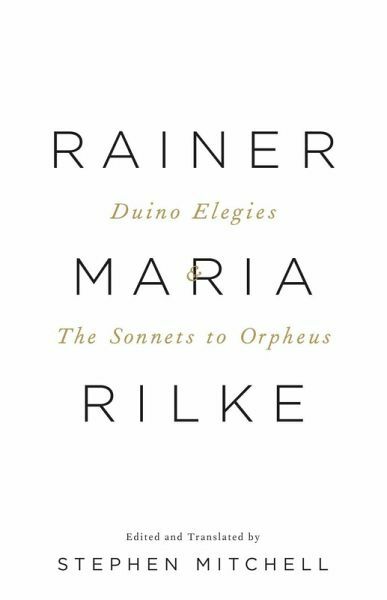 Rilke is unquestionably the twentieth century's most significant and compelling poet of romantic transformation and spiritual quest. His poems of ecstatic identification with the world exert perennial fascination. In Stephen Mitchell's versions of Rilke's two greatest masterpieces readers will discover an English rendering that captures the lyric intensity, fluency, and reach of his poetry. Stephen Mitchell adheres impeccably to Rilke's text, to his formal music, and to the complexity of his thought; at the same time, Mitchell's work has authority and power as poetry in its own right. Rainer Maria Rilke (1875-1926) is one of the greatest lyric German poets. Born in Prague, he published his first book of poems, Leben und Lieber, at age nineteen. He met Lou Salomé, the talented and spirited daughter of a Russian army officer, who influenced him deeply. In 1902 he became the friend, and for a time the secretary, of Rodin, and it was during his twelve-year Paris residence that Rilke enjoyed his greatest poetic activity. In 1919 he went to Switzerland where he spent the last years of his life. It was there that he wrote his last two works, Duino Elegies (1923) and The Sonnets to Orpheus (1923). About the Translator: Stephen Mitchell was born in Brooklyn in 1943 and studied at Amherst, the University of Paris and Yale. Considered one of the preeminent translators of his generation he has translated many classic texts including Gilgamesh, The Bhagavad Gita, Tao Te Ching and the Book of Job.